More and more families are reacquainting themselves with the fun staying and home and entertaining has to offer. Whether this is by personal choice or it’s deemed best for finances, the reality of the matter is staying at home and having a little backyard fun can make for some great memories. One of the things that can be added to the landscape to really kick up the entertainment appeal of a home are outdoor fireplaces. Providing a way to make a backyard truly spectacular, outdoor fireplaces have a lot of practical purposes. Beyond their looks, these devices can be great for cooking, heating and more. Generally more affordable than their indoor counterparts, these designs can be as elaborate or as simplistic as a homeowner might desire. 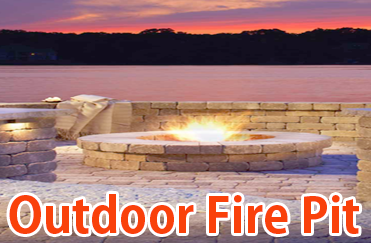 Outdoor fireplaces come in two basic types – those that people make themselves and professional installations. Both are more than acceptable to use, but it’s important to make sure these fireplaces have proper screens and grates, are designed to contain the fire correctly and offer proper ventilation. It’s also a good idea to ensure they are located in a place where any flying embers won’t cause a fire hazard and do keep small children away from them when they’re in use. * Beauty. Outdoor fireplaces can be nothing more than beautiful things to look at. Those who enjoy sitting in their backyards over the indoors often add these to the landscape to create a conversation peace for friends, family, and guests. * Heat. Many geographical locations are just a little too nippy to enjoy the outdoors for too long. Outdoor fireplaces can extend the ability for a family to enjoy dinner on the back porch for a few more weeks going into the winter and even longer. For this alone, many families find backyard fireplaces great choices to add. They are also wonderful options for use at “bonfires” as they tend to be a bit safer. There’s just something comforting about lining up chairs and a table in front of an outdoor fireplace for outdoor entertaining. When included in full backyard kitchen designs, these can be amazing to have around. * Affordability. It is often simply a lot cheaper to add a backyard fireplace to a home than one that’s included on the inside. Since they won’t require structural changes to the house, these are great choices for those on a budget that still want to enjoy the beauty of a fireplace. Outdoor fireplaces that are built correctly can double as cooking devices, too. Depending on the size and design, an outdoor fireplace might even work as a brick oven for making outstanding, outdoors pizzas and more, too.